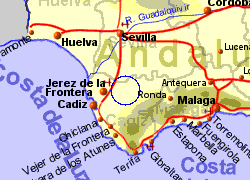 Situated approximatley 50 Km inland from the Costa de la Luz, in the province of Cadiz, Arcos de la Frontera is a large Pueblo Blanco (white village or town) dramatically positioned on a limestone cliff upto 150m high. The old town, understandably declared a National Historic Monument in 1962, is an exceptional example of narrow cobbled streets winding up to a castle, the 15th century Castillo de los Arcos. 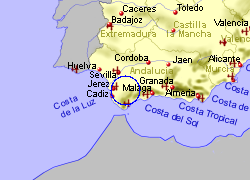 You will also find some quite palacial residences built in the 18th century and some fine baroque architecture, and of course traditional tapas bars and good restaurants. 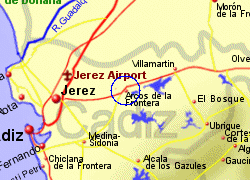 Map of the Arcos de la Frontera area.